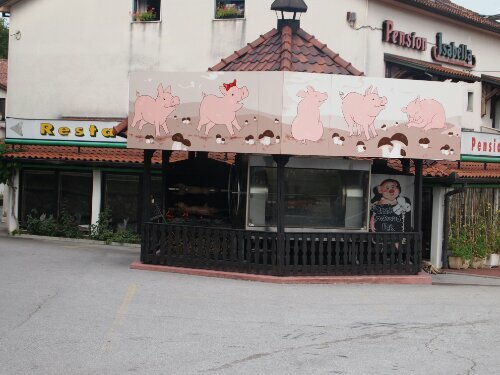 Entering Slovenia it became clear very quickly that we’d left behind Italy, for one thing every restaurant we passed seemed to have one or two whole pigs roasting on spits outside. Also everything felt more rural and quieter, we’d climbed about five hundred metres up onto a plateau and there were mountains and forests to either side rather than fields and villages. Not long after arriving in Slovenia, Suzie, Mathus and I decided to make camp for the night. We rode for a bit and found a field a little sheltered from the road and stopped there. It was perhaps a little closer than was prudent to traffic but in the end no one disturbed us. Up in the Slovenian hills the sky was wonderfully clear and there was very little light pollution so I could see thousands of stars and even a shooting one. 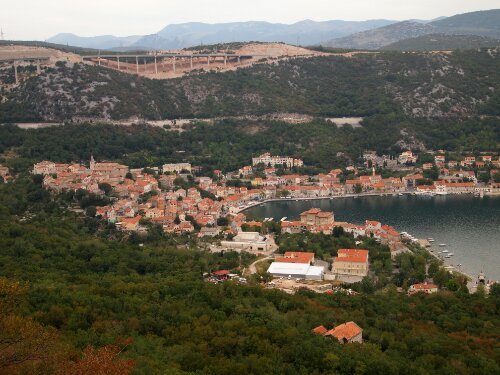 The next day we carried on our way and soon made it to Croatia, my second new country. We rode for a bit longer up in the hills, surrounded still by forest and passing the occasional village. 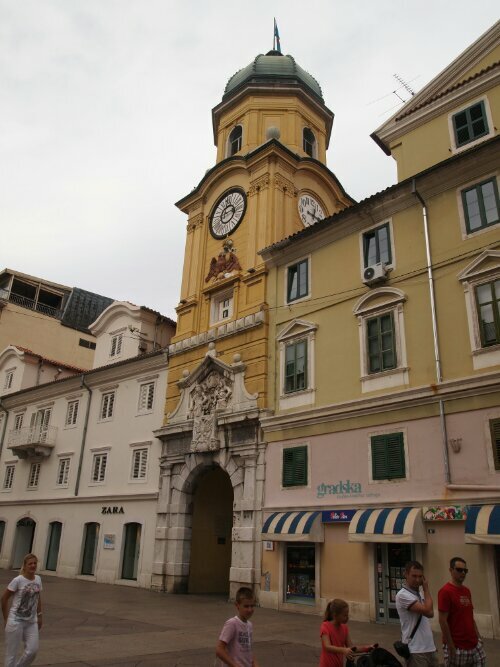 Till we eventually reached Rijeka, the first major Croatian town. Here we had a bit of a look round and ate lunch. We also managed to find free WiFi in the centre. Sadly though it was here I would have to bid goodbye to my new friends as they headed north back towards home. I was sad to do so as I’d enjoyed the companionship of riding with others. Off I went though, solo again, consoling myself with the new things I would see. Almost immediately after leaving Rijeka I was treated to riding along an amazing coast road, raised up above the Adriatic there were stunning views. 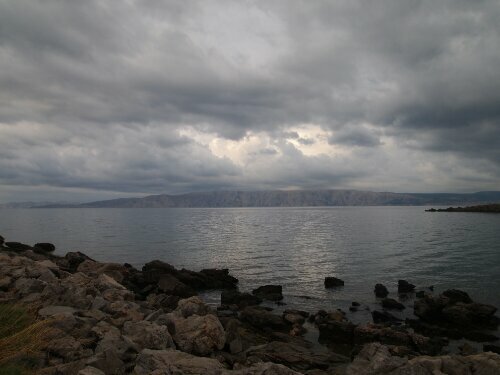 The weather was perfect and the scenery fantastic, Croatia was already seeming like a great idea. 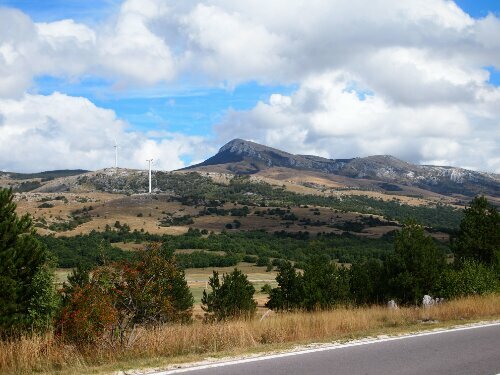 I carried on riding till a campsite at Klenovica that was marked on my map (two days without a shower being enough). Descending from the road down to the sea, which the pitches were but a stones throw away from. A descent I knew I’d have to reverse in the morning. The campsite was fine, the price dropping in line with the facilities compared to France and Italy. Still the view was far better than those I’d had before. When I’d arrived the weather had been perfect, this changed over night with it raining heavily. When it started I had to scurry out of my tent to make sure everything was secure as I’d not pitched up that well, expecting good weather. I’d also done a lot of hand washing which was a touch wasted as the rain was so heavy it splattered mud. I thus woke in the morning a touch grumpy and took my time packing. After heading up to pay I used the reception WiFi to work out where I’d reach next. I also checked warmshowers.org to see if there were any hosts nearby. I noticed one host about 130km away which would be just about the limit of my range that day. I then made what turned out to be the excellent decision to text Ivica, the warmshowers host on the off chance he’d be OK with having me. Having done so I headed off back up the hill to the road. I then checked my map and saw I had to take a side road up a hill into the mountains per the route I’d planned, which was supposed to follow the Eurovelo 8 cross continental cycle path. An hour and a half later and only 10km travelled I was wondering if someone was having a laugh. The road had taken me up and up on 11% to 12% climbs to about 800m above sea level. I was really in the middle of nowhere and wondering if I would make my target. On the bright side Ivica had texted back very quickly making me welcome so as I knew I wouldn’t have to find a camp that night I had some more riding time. I decided to press on. Thankfully going forward the ride was a lot easier, with more down than up. 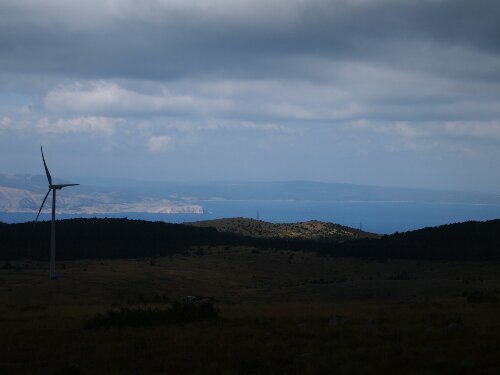 The views were breathtaking as well with rocky Croatian islands in the distance of the coast. It was also beautifully bleak up at the top with less vegetation, probably because the wind had blasted it away! As I continued on, my route wound through little villages where people seemed friendly as everyone waved at me. 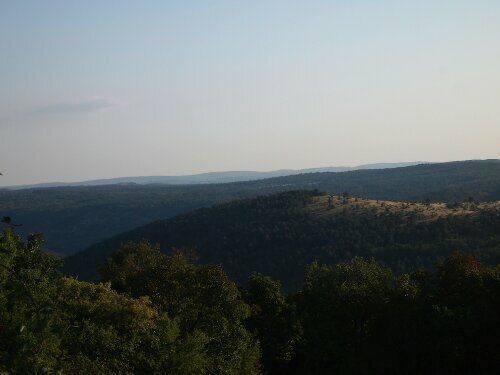 Eventually I made it down into the long Gacka river valley which as you might expect was flat. At the same time it felt high with mountains on either side. Of course I had to climb up out of it again. Luckily the sun was out so I was in a good mood. I still had a long way to go though and kept on riding more confident of reaching my destination that day. 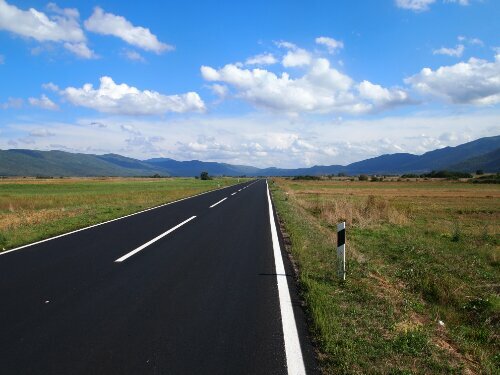 When I reached Gospic the nearest large town to where Ivica lives I messaged to say I’d be there Asap and set out on the final part of the ride. Most of which would be in the twilight and it turned out later the rain and dark. This made for some pretty nervous riding as there are no street lamps in rural Croatia and I had about 30km to cover. In the end it was OK and I rolled up to the beer house Pupi where Ivica had arranged to meet me. To my relief he rode up shortly and started immediately with the incredible generosity that would be a feature of my stay by buying me a beer and some delicious sausage. We then sat and chatted for a couple of hours, joined by two of Ivica’s friends: Mario and Danijela. I was introduced to a new drink: medica a honey liqueur which was delicious. 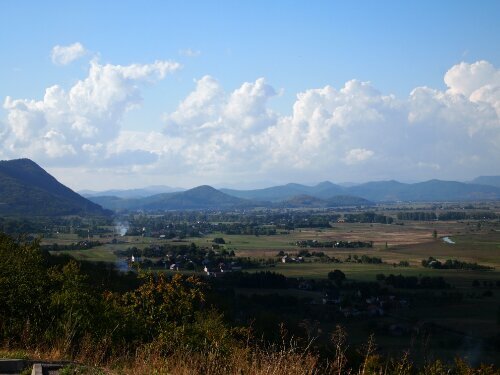 We then headed back to Lovinac the nearby village where Ivica lived. Upon arrival I was treated to more food that Ivica’s mother had prepared and was made to feel very at home. The next morning I would have to myself as Ivica would need to work, as the local postmaster his hours seemed pretty good as he said he’d be finished around twelve with a bit more work to do before two and then done. Instructed to pop round to the post office at twelve, I did so and we headed round the village to deliver a few uncollected letters. Ivica knew everyone and was constantly waving or beeping his horn as he went. 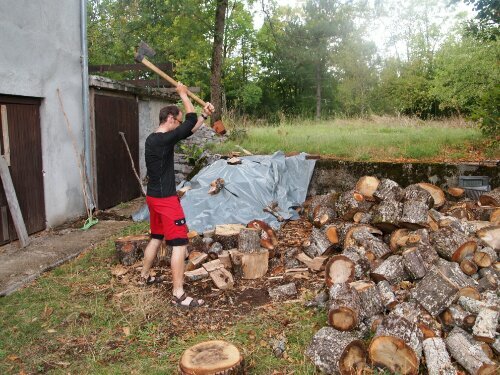 Once finished up at work Ivica said he’d teach me how to chop wood as I’d asked half joking. I managed to get a few logs and still have all my limbs. We also managed to fit in checking over my bike and playing darts, both things Ivica was able to improve my abilities regarding. 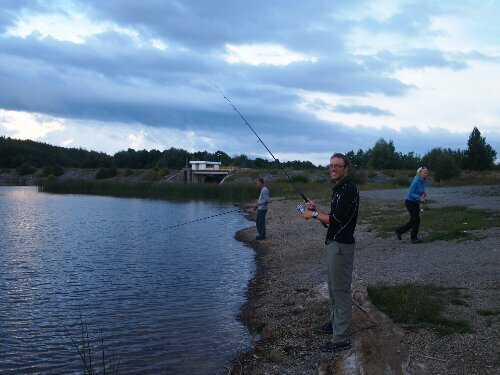 Next up was fishing and we headed out to a local lake with Mario and Danijela. In spite of Ivica’s expert tuition the only thing I caught was pond weed. That evening we had a few more drinks at the pub and then headed back to another delicious meal prepared by Ivica’s mother, an energetic eighty year old. Ivica and his mother were so kind throughout my stay making sure I was well fed and entertained that Ivica had to tell me to stop saying thank you every five seconds. The next day after a hearty breakfast I set off on the next leg of my journey which I’d changed on Ivica’s advice so I could take in some of Bosnia. I started off well, making good time in spite of bad weather. Then about an hour and a half in things went wrong. I struggled to get over a hill that might better be described as a bump. That didn’t feel right… My stomach didn’t feel right either so I got off my bike to see if it would sort itself out. It didn’t and I was feeling decidedly off, so I propped my bike against a sign and waited a bit more. The more I waited the less I wanted to start riding again, until I eventually sat down. Luckily the rain was stopping. Having sat down I then stretched out on the ground by the side of the road hoping my stomach would improve, it still wasn’t, so I tried to sleep. I dozed until I heard footsteps, a kindly German couple were checking if I was OK laid out by the side of the road by my bike. I assured them I was fine just stomach trouble (I hoped). Having laid down a bit I was feeling a little better so I got up and thought about continuing. Unfortunately ahead was a hill which I knew would take some effort to get over so I couldn’t just roll along to see what was ahead. Once finished I immediately felt about 60% and ready to continue. The shortish climb that followed felt worse than any I’d done before when not sick. I got about a five hundred metres up and had to stop for a rest – I took the opportunity to air some still damp laundry on the steel road side protectors, which must have looked a little strange. About ten minutes later I struggled to the top and thankfully over into a long long descent. I’d hoped to find a shop to buy a coke and something bland to calm my stomach and restore my energy. No such luck, I passed a few villages, none showing any signs of commerce. I was really in the middle of nowhere. I continued, feeling a little weaker as I went but not really wanting to pitch my camp to rest as I knew a thunderstorm was forecast and I really wanted some amenities in case my condition worsened. The scenery was still beautiful even if I was less inclined to appreciate it. I crawled on the world turning a little yellow around the edges watching the metres tick by on my cycle computer and hoping the series of bends coming up on my map were hair pins on a descent not an ascent. Thankfully they were down and I cruised into Knin where I hope I’d find a room. Which I did, seeing a big notice saying Soba/room on the side of a building and a sign with a reassuring, for my wallet, one star from the Croatian tourist board underneath. I’d found my home for the next couple of days recovery and fortunately it was clean, cheap and run by a kind family. They helped me put my bike away and made up my bed quickly and left me to it as I went to bed at six in the evening. The next morning when I asked for another night as I was too weak to continue the proprietoress made me a herbal tea for my stomach. Her husband then insisted I drank some of his home made raki distilled from juniper berries, also for my stomach. I’m not sure if it actually helped my stomach but a double of home brew certainly perked me up! They were then kind enough to invite me for lunch as I clearly didn’t look capable of fending for myself. By the afternoon I was much better and hoping I’d be able to continue towards Mostar the next day. Over 4,000km already that’s just amazing! We wish you more happy stories and lot of sun! Enjoy your trip and keep us posted that’s a pleasure to read your blog!